cubs vs. white sox - the age old debate in our lovely city. while i hail from a cubs family, josh's are sox fans. 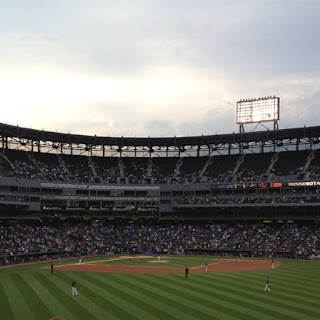 so on a beautiful chicago summer night, we headed to u.s. cellular field : the baseball stadium formerly known as comiskey park. "the cell" (that one's for you, josh) used to have a veggie & hummus cup (i use the word "hummus" loosely here) on the menu that was vegan. 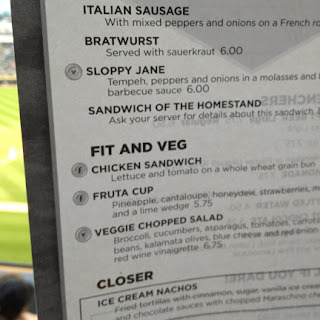 not your typical baseball park fare. but that went away this season. boo! josh & i had gone to dinner at davanti enoteca before the game, assuming there'd be nothing really for me to eat. i asked to see an ingredient list ... yes, the veggie hot dog is vegan. (allergens = soy, wheat & mustard). they also have a morningstar garden burger, but they couldn't find that ingredient list. now, morningstar does have a vegan burger, but they also have a non-vegan burger. 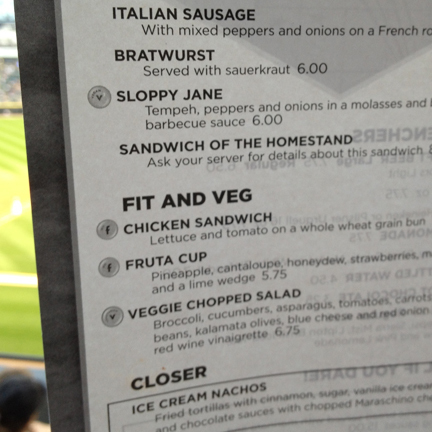 so not sure which one they have at sox park, but worth asking about if you're there & hungry. after our tour of the outfield, we headed to our seats in the club level. but first, a stop at the bar. the v markers indicate vegetarian ... but obviously you could ask for no cheese on the chopped salad ... and i'm not sure what the point of making a tempeh sandwich that isn't vegan would be. our waitress never really came over by us, but next time, i plan to ask more questions. if you're there first, let me know! i might guess that the lemon italian ice, fruta cup, soft pretzels & maybe even more are vegan, too. but i didn't get that far. i'm not going to be too judgemental here. i mean, it's a baseball stadium. beer, peanuts & hot dogs are the usual food groups. but u.s. cellular won't leave you hanging. they do a good job. so don't worry. you won't go hungry. go sox! but also, go cubs!